Selecting the right contractor for your job is paramount in ensuring quality results. There are a few tips that we recommend following when selecting a contractor. Before deciding on a contractor, make sure that you check around not limiting yourself to one contractor. Ask around to see if any of your friends can refer someone who they know does quality work. Looking at pictures of a contractors work is helpful, but there is no replacement for actually going out and looking at work they have done. If the contractor is confident in their work they will have no problem sending you to a job they have done. It is important to make sure you know exactly what you are getting. It is also helpful to know how many stamped concrete patios do they do a month, or what percent of their business is decorative concrete. There are a lot of concrete workers out there and just because they have poured concrete does not mean that they are experienced in the proper stamping techniques. You may want to see if they are a member of any concrete associations or have they received any accreditations for their work. A good contractor will have some sort of accreditation which means they take pride in their work and in meeting industry standards. A typical stamped concrete patio is poured on a 4” compacted gravel base. Wire, rebar, fiber mesh. Make sure they are taking proper measures to reinforce the slab to protect against cracking. Be sure they include the cost of colorant, and how they are planning on coloring (i.e. Color Hardener, Liquid Color). Make sure the quote includes sealing the job as the final step. While it may be the homeowner’s responsibility to reseal the concrete every few years, it is initially the contractor’s job to seal as the final step. When looking over a quote make sure to note what the contractor wants for a down payment. When getting prices from contractors, if there is a large discrepancy in price, make sure you look at the lowest bidders work to make sure it is quality. Cheaper price doesn’t necessarily translate into better work. When looking at their work pay close attention to detail. The small details of a job are what separate the quality contractors from those just trying to earn a buck. Many homeowners already have a good idea of what kind of stamp pattern they want going into a project. Patterns typically stand alone and do not always have to be chosen dependent upon existing features of the house. However, many homeowners who have a brick house for instance, pick a brick pattern for their stamped concrete to match. Picking a pattern is often an independent decision and is what makes your patio unique to you. Click here to see stamp patterns that are available. 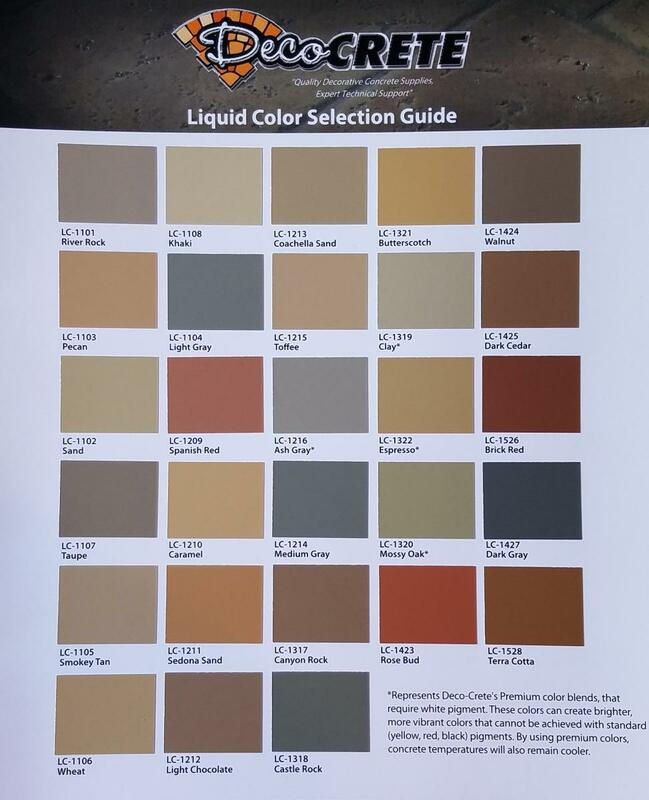 Deciding on the color of your stamped patio is often a hard decision. You know your stamped concrete is going to be around for the duration of your time at the house, if not forever, so you want to make sure you like the color. When picking your base color, whether integral color or color hardener, it is more common to go with a color that is not too dark. Dark base colors, when used with a dark release, do not reveal the full amount of detail and texture that is in the pattern. Using a lighter base color in conjunction with a dark release allows for a more natural look that shows more texture. There is no defined guideline for picking the base color of your patio. Again, this decision is ultimately yours and yours alone. When looking at color options it is helpful to look at what colors already exist on your house. Shutters, roofs, and exterior trim are all accent colors on your home that you can pick up on and try to incorporate into your stamped patio. If you are having trouble picking out colors feel free to bring small pieces of siding, trim, shutters, etc. into our design center and showroom and one of our experienced decorative concrete consultants will be happy to help you pick a color that will go great with your home. Our showroom is full of colors. You may also view color charts for Deco-Crete CH RA and Deco-Crete Liquid Colors. Steps and borders are the small details that can set your patio or walkway apart and move it from functional concrete to a work of art. While they cost a little extra, the variation they bring to your pad make it a great conversation piece. Borders are typically a darker color than the main pad but still compliment it. Some people use the color of their release as the color of their border to pull everything together.